In updated results of a phase II study of infigratinib, the selective pan-FGFR kinase inhibitor showed a manageable toxicity profile and clinically meaningful activity following chemotherapy in patients with intrahepatic cholangiocarcinoma (IHC). Patients enrolled in this multicenter, open-label study (n = 71), which were presented at the 2018 ESMO Congress, have FGFR fusions, which occur in approximately 13% to 17% of patients with IHC. This is one of the first studies to target patients with IHC by actionable mutations, said lead author Milind Javle, MD. Results showed that the overall response rate (ORR) was 31.5% (95% CI, 20.5%-43.1%), and the investigator-assessed ORR was 26.9% (95% CI, 16.8%-39.1%). The disease control rate was 86.9%, with a median duration of response of 5.4 months. Moreover, the median progression-free survival (PFS) and overall survival (OS) were 6.8 months (95% CI, 5.8-7.6) and 12.5 months (9.9-16.6), respectively. 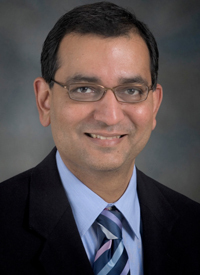 In an interview with OncLive, Javle, professor, Department of Gastrointestinal Medical Oncology, Division of Cancer Medicine, The University of Texas MD Anderson Cancer Center, discussed the findings from this phase II study and emphasized the importance of molecular testing in cholangiocarcinoma. OncLive: Could you begin with some background on this drug and the phase II trial? Javle: The molecular profiling of cholangiocarcinoma is transforming this disease, as it has more actionable mutations than most other gastrointestinal cancers. We began this FGFR-directed trial close to 5 years ago, we really thought that this would be a difficult trial to implement because there has never been a targeted therapy trial in cholangiocarcinoma against a specific genetic mutation. FGFR fusions occur in about 15% of IHC. It is a rare subset in a rare disease. We thought this would be hard to do, but we finished the enrollment in less than 2 years. In general, patients with cholangiocarcinoma receive first-line chemotherapy with gemcitabine or cisplatin. In the second-line setting, there are very few options, and the progression-free survival (PFS) is usually 3 months with standard therapy, such as capecitabine, 5-fluorouracil or FOLFOX. Unfortunately, these patients have pretty poor outcomes and there are quality-of-life (QoL) issues with second-line chemotherapy. With this trial, we showed that the PFS was close to 6 months, and we noticed that the original response rate was much lower. It has now increased to more than 25%. As these patients are followed longer, overall response rate rises due to delayed responses. The overall survival is close to 1 year from the time that patients were enrolled. This study has taught us a lot about this disease. First, [it taught us] that FGFR fusions occur in 15% of patients, but more so in the younger population and often in women. These patients do benefit with targeted FGFR inhibition. The vast majority of patients either have response or stable disease. The disease control rate was 80%, so that is quite remarkable for a targeted therapy in this disease. Based on the findings thus far, are there any next steps? The next step here is to see whether we can expand this experience in the first-line setting, where this drug can be given upfront without chemotherapy. I believe that the efficacy will be seen in the first-line setting as well. In our study, we showed that whether you give second- or a subsequent line of therapy, the PFS did not really change, although the response rate was a little higher if the patient had received 1 prior line of therapy versus several lines. I am hoping that eventually, we may show that these patients can be treated with FGFR-targeted therapy without the need for chemotherapy. Currently, this is the largest trial of patients with FGFR fusions, and it also has the longest follow-up. You mentioned that molecular testing is very important in this subset of patients. What is the prevalence of molecular testing for patients diagnosed with cholangiocarcinoma? We believe that next-generation sequencing (NGS) and molecular testing should be the standard for cholangiocarcinoma. With the advent of immunotherapy for microsatellite instability-high patients, and with these newer targeted therapies, [molecular testing] opens the door for successful treatments. Unfortunately, it is still not standard of care in most parts of the world, including the United States. Outside of major academic centers, providers do not routinely request NGS. When we looked at our series of more than 500 patients with cholangiocarcinoma, we found that even when you try to do it in all patients, only about 40% of patients have adequate tissue for NGS. You need a large core biopsy and adequate viable DNA. The yield of NGS is higher in IHC, where it is about 60%. In extrahepatic IHC, the tissue is often very low, so it is more like 20%.